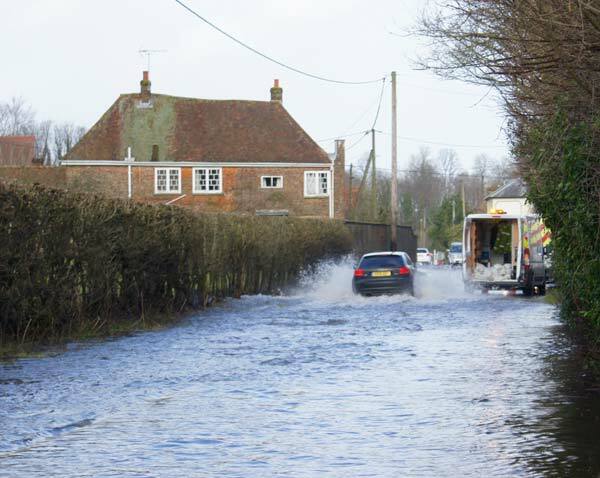 The East Hampshire District Council press office has been making a lot of noise about the £300,000 allocated to the "Flood Prevention scheme on the A32" but will the problem be solved? The investigation was not conducted with any degree of urgency and according to the Press release the " . . flood was the result of the heaviest rainfall for 200 years . . " although it is a lot less than 200 years since the previous major flood in 2000-2001 (left) which eventually resulted in the demolition of the Chase Field Estate. Just what the conclusion of the EHDC flood survey reached has not been made public but again, according to the press release, the plan is to clear all the existing ditches, culverts and drains and replace or "upsize" where necessary. With the exception of the "upsizing", ditch and drain maintenance should be a routine procedure anyway but this doesn't address the basic problem. As any long term resident of Farringdon knows only too well, the field where Shirnall Meadows was built, to the South of the crossroads on the Eastern side of the A32, flooded at some time during most winters as a lavant stream flows from beyond Newton Valence to Chawton. Most of the year the flow passes through the porous subsoil underneath the roads towards Chawton and eventually emerges into a ditch which runs under the Selborne road and into the River Wey via Caker Stream. When the flow, with the addition of surface run off when the surrounding fields are saturated, exceeds the volume which can flow beneath the road, the crossroads acts as a dam and water levels in the Recreation Ground begin to rise. If flows continue to increase water will eventually flow over the top and flood along the A32 until it can escape into the fields and culverts under New Road and rejoin the lavant flow down to Chawton. Some years ago here was a ditch to the east of the A32 which ran more or less parallel to it and allowed a considerable quantity of water to bypass the main road and flow round the back of the cottages towards Chawton. This didn't totally prevent surface water running down the main road but it certainly reduced the flow. This ditch was eventually filled in as houses were added and no longer available as an overflow. The problem was also exacerbated when main drainage was installed in Farringdon as the drains came down Shirnall Hill to the A32 and the installation of pipes and disturbance of the subsoil significantly reduced flow capacity beneath the road. It would be unrealistic to expect a solution to prevent any flooding in the recreation ground and the occasional overflow down the A32 in extreme weather conditions for both financial reasons and the fact that the sudden surge in discharge rates that would be required could cause problems for Chawton and other areas downstream. However with an alternative outlet, any A32 flooding would not be so severe and would not result in the long term disruption Farringdon has suffered in previous years. Will this or some effective alternative scheme ever be completed? Who can tell, the recent record of the EHDC doesn't offer much hope for consultation, the contract to replace the Alton Sports Centre with a smaller and inferior Leisure Centre was signed and sealed with little consideration for the needs of Alton and the surrounding communities, took no account of the increased population using the facility, or the various sports clubs that rely on the centre and subsequent "consultation" meetings appear to be nothing more than a public relations exercise. So where does that leave the residents of Farringdon who are threatened with flooding every few years, probably up the creek with an inadequate supply of sand bags if previous experience is anything to go by, we can only hope the next set of local elections might engender some action but I wouldn't put money on it.